SEOUL, Feb. 11 (Yonhap) -- Conservative groups held a protest in downtown Seoul on Saturday, calling for the Constitutional Court to reject President Park Geun-hye's impeachment and dissolve the special prosecutor team investigating the presidential scandal. 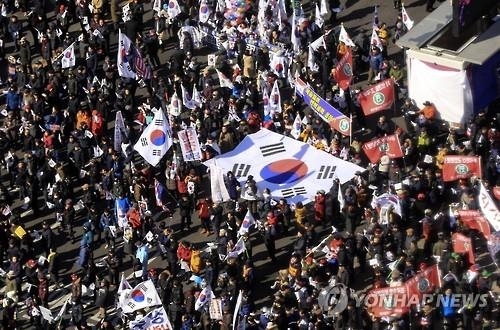 Park's supporters, marked by their waving of the Korean flag, occupied the streets outside of Seoul City Hall from 2 p.m. and staged their 12th rally. Rep. Cho Won-jin of the ruling Saenuri Party attended the rally and threw in his support. "If President Park falls, so will the country's security," Cho said in a rally speech. The organizers claimed that around 2.1 million people gathered but that number cannot be independently verified. Park's critics were also preparing a mass rally in Seoul to demand her immediate resignation over a corruption scandal centered on the president's long-time confidante Choi Soon-sil. Park was impeached by parliament in December over the corruption scandal involving Choi. The top court may make its ruling to determine whether to unseat or reinstate the president before March 13 when another justice retires and creates another vacancy on the already short-handed bench.